Inmarsat (LSE:ISAT.L) supported the National Oceanic and Atmospheric Administration (NOAA) team during Operation Deep Freeze 2016, while on board the U.S. Coast Guard’s (USCG) Heavy Icebreaker Polar Star. Polar Star’s primary mission during Operation Deep Freeze is to break a channel through the sea ice for ships to resupply the McMurdo Research Station in the Ross Sea (located at 77 degrees 51 minutes S, 166 degrees 40 minutes E). The Polar Star cleared ice obstructions up to 15 feet thick to open up a “superhighway” for an oil tanker and a supply ship, so the ships could get to and from McMurdo Station to deliver fuel, food and other supplies. NOAA’s primary role involved collecting and transmitting data, images and video from unmanned Puma All Environment (AE) aircraft. They used Inmarsat satellite communications for constant connectivity. The AeroVironment Puma AE is a small unmanned aircraft system (UAS) designed for land-based and maritime operations. The hand-launched, 13.5 pound Puma AE can fly for more than 210 minutes at a time, at a maximum range of approximately 12 miles. NOAA used the Puma AE to “scout” ahead of the Polar Star’s path, collecting data and images to deliver real-time information about the potential for treacherous conditions. Inmarsat’s satellite communication services supported the mission by providing critical data and voice connectivity to the outside world, including aviation coordination and command centers in Antarctica and in North America. Without Inmarsat’s communication services, the Puma crew’s capability for operating would have been severely limited due to the lack of reliable communications with air traffic controllers, and the dissemination of the data would have been limited to personal aboard the ship. Additionally, there would have not been a way for the ice and weather forecasters to send and receive the images taken from satellites in space. For the two-month-long operation, Inmarsat’s SATCOM services served as the sole link to NOAA operations and their families. The network included the company's BGAN service via Hughes 9450-C10 BGAN Mobile Satellite Terminal and Global Satellite Phone Service (GSPS) via the IsatPhone 2 handset. Thanks to “plug and play” ease-of-installation made possible by Inmarsat’s managed, on-demand capability, crew members spent minimal time installing, troubleshooting and configuring the system, thereby enabling them to focus on the mission. “The unmanned aircraft observational images and data provide a real-time capability that is critical for tactical use. Having high-resolution imaging can make our ice forecasting more accurate by providing ‘ground truth’ and validating the forecasts. 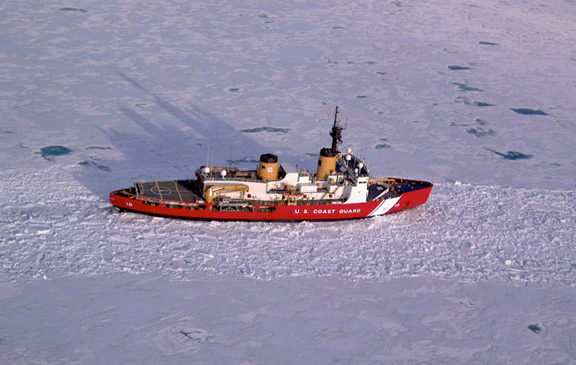 The objective is to be able to tell the crew exactly where the ice is, and how thick it is in order to help the Coast Guard navigate the ship safely and efficiently,” said Todd Jacobs, a project scientist at the NOAA Office of Oceanic and Atmospheric Research’s Unmanned Aircraft Systems Program and the deputy superintendent for operations and administration of the Channel Islands National Marine Sanctuary. “Team members were free to download and transmit data reports, ice and weather forecasts, images and video clips to and from command centers in Washington D.C., Florida, California and Antarctica,” said Kai Tang, Inmarsat’s Vice President of Market Development, U.S. Government. He add that even as the rough seas caused major rolling while crossing the southern ocean on the Polar Star, and wind levels grew severe, the ship maintained Inmarsat satellite connectivity. Such success can certainly be attributed to the company heavily investing in innovative, small-form-factor solutions for various platforms and applications.